21 of our favourite turntable cameos in films and TV shows | What Hi-Fi? "What turntable is that?" Like us, you probably utter that question whenever you spy a decent deck on your TV or cinema screen. Odds are it's a Technics or a Pro-Ject, but every once in a while you come across something really different, something very vintage, or something just plain beautiful. Sometimes the chosen deck is incidental set-dressing; maybe it just looked nice. But we like to think the turntable chosen in every instance gives us a deeper insight into the character connected with it. It says something about them. So we'll leave you with these 21 excellent turntables that were, in our eyes, the real stars of the show. We have to start with this iconic star of the silver screen: the splendid Transcriptors Hydraulic Reference (1964). Designed by Transcriptors founder David Gammon, the Hydraulic Reference is a gorgeous piece of kit. The six gold-plated brass platforms - on top of which the record sat - is its most striking feature. No wonder it caught Stanley Kubrick's eye. J. A. Michell Engineering (of GyroDec fame) took over the manufacturing of Transcriptors turntables under licence from 1973 onwards, but Alex's deck here is an original Gammon production. Who knew the great detective was a McIntosh fan? While BBC's Sherlock favours a one-box Ruark R2i, the CBS version of Holmes is more into traditional hi-fi systems. And naturally, the American show opted for a venerated American brand. The McIntosh stack here includes the MT10 turntable (which costs a hefty £10,000) and matching McIntosh amps. Could this be the oldest record player ever depicted on screen? Vinyl was all the rage in the Stone Age, apparently. That turtle platter looks steady enough, but we hope Fred's adjusted that bird beak's tracking weight accurately. The wonderful Robin William doing what he does best, with the help of some broadcast-standard Garrard turntables. He may be a brilliant diagnostician, but Dr Gregory House's other love is music. Over the course of eight series, we find out this misanthropic genius doctor is also a dab hand at the piano and the guitar (aided by the fact that Hugh Laurie is an accomplished musician himself). He even has his very own hi-fi system in his office. We're not sure about those ribbon tweeter speakers and there's a valve amp in there somewhere (along with his Gibson Flying V), but that turntable - a Sota Comet Series III - is what we'd keep eyeing up if we ever had to visit Dr House. As we were compiling this list, we got thinking: surely, of all the Marvel superheroes, Tony Stark's got to be the one with a crazy flash hi-fi system rigged up at Stark Towers? Not quite. We get a fleeting glimpse of not one but two turntables down in his workshop while he's messing about with his Iron Man suits. It's too fuzzy to tell, but we reckon the one with the yellow-labelled record (A Very Charlie Brown Christmas) playing on it is a Technics. Which he can control by just asking Jarvis to "drop my needle", of course. Forget about that Oscars mix-up. We're all here for this beautiful wooden turntable that steals the show (okay, maybe just for this one scene). It's an Acoustic Research deck called "The Legend", a belt-drive deck with a suspended chassis and Linn LVX tonearm - it would've cost around £250 back in the mid-80s. Say what you want about this video game adaptation, Lara Croft has style. She picks her record (Bach's Piano Concerto in F Minor), plays it on this stunning Clearaudio Master Reference turntable, and embarks on a calming bungee-ballet session in her vast mansion. Right before fighting off an invading troop of gun-toting baddies. This is one of our favourite cameos: a Michell GyroDec SE, one of the prettiest turntables ever made, in the first few minutes of Rian Johnson's sci-fi thriller Looper. 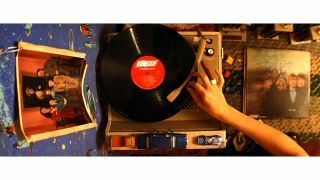 Joe (Joseph Gordon-Levitt) spins Powerful Love by Chuck & Mac on the deck (which has a Rega RB300 tonearm), while brushing up on his French word of the day and getting ready for a night out with the boys. "What about the polar bears?" you ask. "What about that fully automatic direct-drive Technics SL-Q3 turntable?" we reply. In the series five episode "Lady Lazarus", Megan Draper hands her husband the Revolver album and tells him to start with this one. Draper duly spins Tomorrow Never Knows on his turntable-and-drinks-cabinet combo. The show creators paid $250,000 to use the master track in this very scene - it's the highest amount ever paid to license a song for TV. Draper listens for about a minute, but then decidedly shuts it off. The swingin' 60s youth culture - and The Beatles - clearly don't agree with the ad man. To experience a semblance of Draper's turntable-and-drinks-cabinet combo, visit Spiritland at King's Cross, London - or you can simply store bottles instead of LPs in this handsome Wrensilva Sonos Edition Console. "What's happening to them? What's killing them?" "I think it must be my music." It certainly was: Grandma Florence Norris is playing her favourite Slim Whitman record (Indian Love Call, in this instance) on what appears to be a one-unit General Electric turntable that looks a bit like a stove (with amp, tonal controls and headphone stage placed above the deck) when bloodthirsty invading Martians arrive. But her headphones get unplugged from her system, and Whitman's ensuing yodelling makes the aliens' heads explode. Hooray. The highlight of this action thriller remake is the central character's hi-fi system: a beautifully displayed Pro-Ject RPM 9.2 Evolution turntable, complete with a McIntosh C22 Reissue preamp, Jolida 502BRC valve amplifier and Pinnacle BD 1000 Tower speakers. Jason Statham delicately handles the vinyl, lovingly puts the clamp on and gently guides the needle in position - it's his pride and joy. Shame he sets it all on fire later on. "This is my record player, it works with batteries." It's her brother's, actually, and the deck in question is a 1960s Japanese Barrington in a terribly fashionable teal finish. You could run it off mains power, but it's far more fetching as a portable turntable (you need 4 C cell batteries) and it doubles up as an AM radio, too. We can't quite identify this record changing turntable that sits in Nurse Rached's station, but we do know that when it's playing classical music, it's medication time. Wes Anderson again, with a shot of what can only be described as "ultimate hipster aesthetic goals". We hope that trendy all-in-one record player isn't quite as destructive on the vinyl as a Crosley Cruiser. While you were distracted by the, er, plot of this 2011 Michael Fassbender film, we just wanted to spend more time with this Technics SL-1200. I have no idea to this day what those two Italian ladies were singing about. Truth is, I don't want to know. Some things are best left unsaid. I'd like to think they were singing about something so beautiful, it can't be expressed in words, and makes your heart ache because of it. I tell you, those voices soared higher and farther than anybody in a grey place dares to dream. It was like some beautiful bird flapped into our drab little cage and made those walls dissolve away, and for the briefest of moments, every last man in Shawshank felt free. It's nice to know vinyl lives on even in the year 2259. James T. Kirk's living quarters show a neatly arranged turntable and a valve amplifier next to a fancy chess set. New Orleans-based Audiowood is responsible for "The Bachelor" (yep, that's what it's called), and a clearer production shot shows off the full deck with its wooden plinth. Harvey Specter, corporate lawyer extraordinaire, is a vinyl nerd. His office has a wall-to-wall record collection, a Pro-Ject Genie 3 prominently displayed in its own corner, and Klipsch bookshelf speakers behind his desk. While the Pro-Ject system gets shown off and used regularly over the course of Suits' seven series, it didn't start out that way. Harvey's original system in the pilot episode was a completely different Pro-Ject deck and what looks like a Prima Luna valve amplifier. The set designers must've decided the Genie cut a sleeker dash. By sheer dumb alphabetical luck, we end with yet another Transcriptors turntable. This time it's a 1973 Transcriptors Skeleton (albeit without the unusually designed Vestigal tonearm), spinning La Vie En Rose in Matthew Vaughn's X-Men prequel. The story goes that founder David Gammon sketched out this design on a Benson & Hedges cigarette packet in the wee hours of the morning, lest he forgot his brilliant new idea, and went to windscreen manufacturer Triplex to see if they could make the glass case he wanted (acrylic was expensive in those days). They could, and we got this superb-looking deck. Smitten as we are with the Skeleton, we can't help but point out that the 1973 deck most certainly wouldn't have been available to buy during the film's events... which take place in 1962.